Mrs. Bush also speaks on behalf of public/private partnerships between the United States Agency for International Development (USAID), Project Hope, and other private health care organizations that are equipping and training pediatric health care professionals worldwide. She strongly supports the initiative to build a National Children's Hospital in Iraq. Laura Bush is Honorary Ambassador for the Decade of Literacy of the United Nations Educational, Scientific and Cultural Organization (UNESCO), serving as an international spokesperson for efforts to educate people throughout the world, especially women and girls. 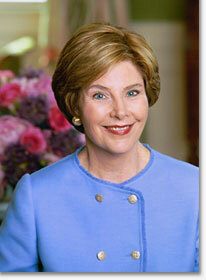 Laura Bush is passionate about the importance and pleasures of reading, and she joined with the Library of Congress to launch the first National Book Festival in Washington, D.C., in September 2001. The 2004 National Book Festival drew 85,000 book-lovers from across the nation.